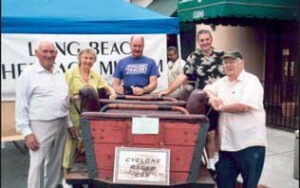 During the next 30 years he collected an amazing assortment of Long Beach artifacts. In 1971, the world-class collector and archivist opened the Long Beach Historical Museum at First Street and Linden Avenue. In the late 1990’s, Ken’s beloved museum closed when the building was slated for demolishment and he was forcedto placed his treasured museum collection in storage. Ken dreamt of finding a new location to house his history of our city, but that dream went unfulfilled. My memories of Ken’s dedication to LB history are numerous. I remember Ken reading about some old building (a hotel, apartments, theatre, church, historic home, etc.) slated to be torn down and he was on his way. He would dig through the rubble to find the interesting things left behind. I used to tease him by introducing him as Long Beach’s original“Dumpster Diver”, a title that always brought a smile to his face. When a building could not be saved, he would save the contents or interior: chandeliers from the Pacific Coast Club, the Cyclone Roller Coaster Car, City Hall files, church pews, theatre seats, telephone switchboards, signs, lampposts, the Iowa Barber Shop, a classic rebuilt 12’ surf board, etc. He would retrieve and save any item which recorded a visual history of Long Beach. As we continue our search for a museum building to fulfill his dream, we are making progress with setting up small exhibits are in the works for a Seaside Printing Gallery, the Great Balboa Film Studio, the Douglas Park Long Beach Airport & Long Beach Aircraft Exhibit and additional exhibits are planned for Looff’s Lite-A-Line. We do have a new obstacle however. The lease of the current warehouse is expiring in mid-2012 and we need to locate a new warehouse to continue our preservation and archival work. Please let me know if you have any ideas or contacts. We will miss Ken for he served as a reminder that not all things arelost and that things worth remembering will be found.